Marvellous Melbourne aims to encourage people to be informed about issues related to urban development in Melbourne. Three cheers for Kevin O'Leary on planning. Tony Recsei of SOS Sydney talks about the number of child deaths in Sydney from high rise apartments. Children are better off on the ground in a house and garden where they can play safely. We are getting it wrong thanks to too high numbers of migrants. Is there room for nature in our cities? OUR CITIES ARE MAKING US SICK says Mark O’Connor and he has proof. Too much concrete and high rise and not enough trees and grass. WHY NOT PLANT AN URBAN FOREST AND STOP BUILDING SO MUCH HIGH RISE. WHO SAYS WE WANT SO MANY PEOPLE COMING HERE - by poll, 73% said NO. So we should reduce immigration. Metropolitan Planning Strategy for Melbourne - Con Job or for Real? To contribute to the survey online click here. The plan is a flat roofed box on the middle platform at the Burke Road end. and is unsuitable for our heritage Station. “The first thing you will see from the bridge. To let you know that I went to the council and looked at the plan for this box. I do not agree at all with it being plonked on the platform. It is a big square flat roofed box and not suitable at all on our heritage station platform. It should assume something like the style and colour of the platform building. I am going to put in an objection and I am also going to let Ted know that it is not good And they will be putting it where it is the first thing you will see from the Burke Road bridge. If it was way down the other end would not be so bad but there it is terribly visible. "Planning should be based on known, absolute and practical limitations, combined with practical and realistic expectations. Fine to aspire to the ultimate luxury of the imagination, but not to nihilistically dismiss the probable or possible consequences as it being somebody else's problem." Overpopulation is the real elephant in the room and is the root problem in this planning and development world as we try to keep Melbourne Marvellous. On the 18th December 2012 Planning Backlash ran an information session for some community group leaders. About 30 Group Leaders, virtually one from each city attended, representing each part of Melbourne from the North, South, East & West.. The aim is to get them to organize information sessions in their own localities to gain input from residents on what they see as the issues that need to be addressed to enable Melbourne to cope with the rate of growth over the next forty years. They all indicated they would consider the best ways to run the consultation program with a view to conducting public information sessions, interviews, surveys etc. We have been assured that the Minister for Planning will provide finance through his Ministerial Department to assist the groups. The objective is to get as much input from the residents and general public as we can, so that the final Melb. Metro. 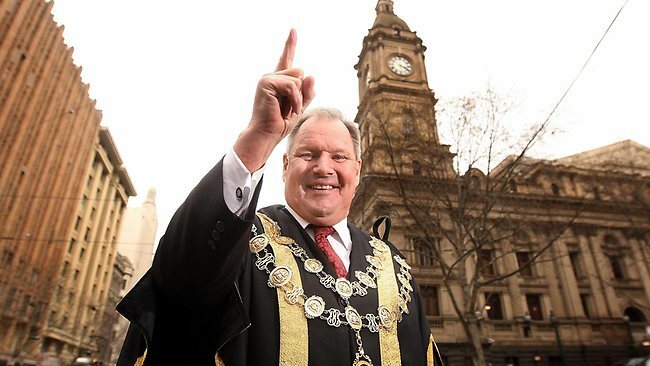 Robert Doyle Lord Mayor Robert Doyle received almost $400,000 in donations for his re-election bid. LORD Mayor Robert Doyle's re-election war chest was bolstered by big donations from developers and from candidates on his own team. Cr Doyle received almost $400,000 in donations for the October poll - up from $81,000 at the 2008 election, according to his team's draft financial return, seen by the Herald Sun. Sounds like our opponents in the Development Industry are prepared to run with this debate, even while admitting that the infrastructure costs of population growth are a major problem for them. The infrastructure cost per extra person in the population is at least $200,000 but may be much higher. Hence the effective bankruptcy of our state governments. Note that this is a conference organised by and dominated by speakers from the development industry. UDIA is one of the many organisations through which the growth lobby speaks. Their speakers are likely to conclude that population growth is inevitable, that developers cannot afford to pay for the extra infrastructure, and therefore the taxpayer must. Conditional statement: This submission is made in good faith but with strong reservations as to the extent to which our position has been compromised by lack of essential information. We have opted to contribute rather than abstain. Our efforts are akin to working on a blind jigsaw puzzle which has many pieces missing. The view of the Fitzroy Residents, and also the Yarra Residents Coalition of which we are a member association, is that a strategic plan for the future of Melbourne and a linked strategic plan for the planning for this future are the prerequisites for an effective review and rewriting of the planning zones. Moreover, the operational mechanisms for translating the zones are also missing. It is difficult to translate the new zones into how and what planning decisions will be made, and over time, what impact these decisions will have on the look of Melbourne. A STEP IN THE RIGHT DIRECTION? We need more of this to take the pressure off Melbourne and give it to the regions that want it. People Power in action gets results. another one on Friday at Royal Park organised by PPL Vic. Follow-up on "A new real vision for Melbourne needed - Immigration numbers and lack of jobs........."
AUSTRALIA'S major immigration visa subclasses need to be culled to slash record high immigration because the growth of jobs has slowed "to a crawl" and migrants are exploiting the system, according to the Centre for Population and Urban Research. McDonalds to come to quiet sancturary of Tecoma 10 Nov 2012 from Marvellous Melbourne on Vimeo. Reclaiming Tecoma from Tim J Smith on Vimeo. THE NEXT PORT NEAR WERRIBEE AND NOT HASTINGS? I MUST ADMIT I HAVE BEEN THINKING THE SAME THING FOR AWHILE, TO SAVE WESTERN PORT. And consider the advantages - good rail line, so can be connected easily to other parts of Australia. Whereas from Hastings they have to come through Melbourne, which is already congested .. Near Avalon airport. Plenty of space. Many advantages. I know the government, both government, have gone down the Hastings route, but if Werribee can be shown to be better then the government must be convinced. WE have heard of borrowed light and now they want to do it with mirrors, in the land of wide open spaces. Makes me feel claustrophobic. We have certainly gone mad if they allow this.